Vitalabs new Mood Formula is a combination of specific ingredients intended to help Enhance Mood, Reduce Stress and Improve Sleep. Included in the formula are: DMAE which helps with alertness and its positive influence on the mood. GABA for its relaxing and anti-anxiety properties. Chamomile Concentrate to help reduce stress and improve sleep. Ashwagandha which is thought to have natural sedative properties. 5-HTP to help improve sleep and for its possible benefits in fighting depression. B-Complex Vitamins including B-1, B-2, B-6, B-12, Folic Acid and Niacinamide for their many benefits in fighting stress and irritability while helping to promote a positive mood. Calcium and Magnesium for their benefits in helping prevent mood swings and depression along with calming the body. 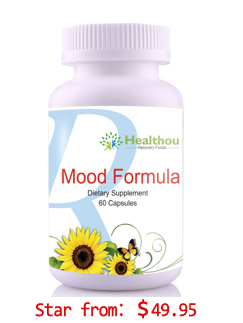 Mood Formula comes in fast dissolving Vegetable Capsules that allow the nutrients to enter the body quickly and effectively. SUGGESTED USE: As a dietary supplement, take one(1) to two (2) capsules daily or as directed by a health care professional. CAUTION:Do not exceed recommended dosage. Avoid driving or operating heavy machinery while taking this product. Not recommended for pregnant or nursing mothers or children under 18 years of age. Not for use by individuals with a known medical condition including liver disease, bipolar (manic)depression or anyone taking prescription medications including anti-depressants or MAO inhibitors. If you have questions about the advisability of taking this product, consult your physician prior to use.